Offered in 4 x 5 ft., 4 x 6 ft. and 5 x 6 ft. sizes, these variable chamber balers offer reliability, simplicity and high quality bales – no matter the conditions. For great looking bales, time after time. TWINE TYING: Automatic twine tying with the fast acting double tube system means simultaneous binding of both edges of the bale, keeping binding time to a minimum. Over crossing of twines in the center of the bale provides no loose ends at the end of the binding cycle. 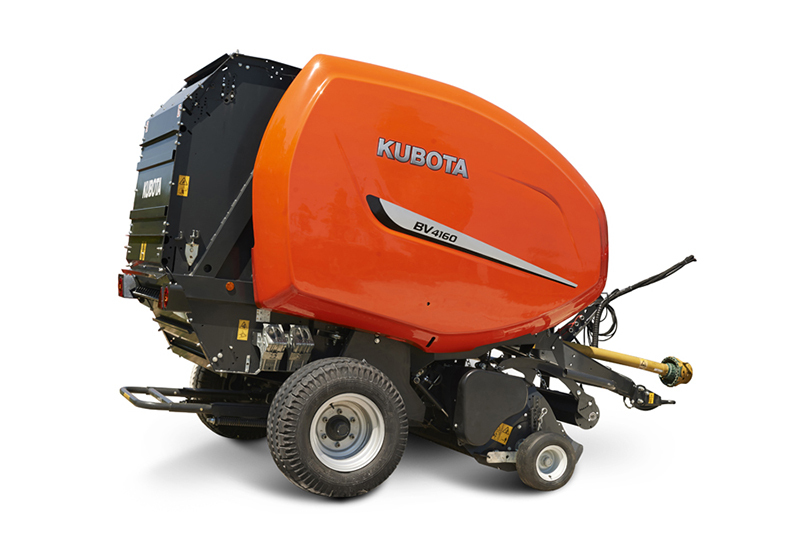 HIGH CAPACITY PICK-UP: Kubota's small diameter pick-up offers superb in field performance. With its low profile design and closely spaced tines, Kubota balers can cleanly lift even the shortest crop. The pick-up is designed for high capacity and efficient intake, providing a smooth and even crop flow into the baler. BV4160 Econo produces bales that are 4 ft. wide by 5 ft. 5 in. tall.